Over two thousand years ago, the fate of the world changed one night. The change was not brought down with thunder or lightning or any of the dramatic special effects that we see in movies these days. There were only the cries of a full-term pregnant woman and the racing heart-beat of her husband, a carpenter, who probably didn't have any experience delivering a child before. In fact they were travelling when it was time for the baby to come. I can't imagine the pain, the fear, the anxiety they would have gone through. The Baby was born that very night and He was laid in a manger! This was the Baby who was to change the course of the world. His birth was so ordinary - no pomp and no spectacular celebrations, in fact not even a cradle or a bed to lay Him in. God chose to bring His one and only Son into this world as a ordinary human being. As we celebrate Christmas this year, just take a moment to recall Jesus' actual birth. 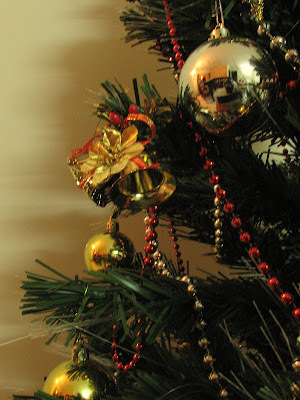 Here are a few snapshots of Christmas from my home. 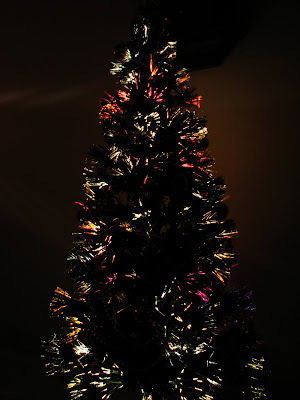 The Christmas Star at our home - Reminiscent of the bright star that marked Jesus birth. 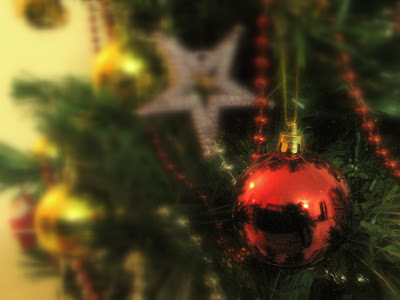 Wish all of you a Merry Christmas and a Happy New Year. I never thought much about miracles till the day I gave birth to my son. Even though it was amidst all the modern conveniences of advanced medical care, spotless hygiene and pain relieving injections (at the very end), the pain of child-birth is still the most painful thing imaginable. And after all that pain and fear, when you finally see your child, you are amazed at this miracle that you cradle in your arms. At the very heart of it, inspite of the tremendous advances in medical science, every baby is truly a miracle and a gift. 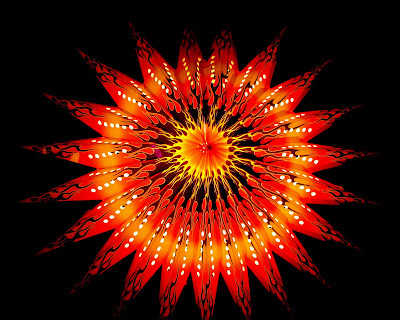 Can anyone fully fathom the birth of a new life - a life with heart and soul and intelligence? The birth of a child is one of the most intense experiences I know of . The intense pain and fear and the intense happiness and relief afterwards are incomparable to anything else. Now on to the recipe. Dark chocolate and Orange are two of my favourite flavours. I was experimenting on a cake with these 2 intense flavours. And it was an astounding success! In fact it is one of the best tasting cakes I have ever baked. And boy, the flavours in this cake are truly intense. So I made this in tiny cupcake moulds - the one that is smaller than muffin moulds. This cake is defnitely for those who want to celebrate the intensely happy moments of life. When I was a little girl, I used to dream v interesting dreams such as eating a never-ending bar of chocolate :). It would be the soft and creamy kind of chocolate which isn't too sweet and just melts in your mouth. There would also be a fountains flowing with melted chocolate in my dream. The chocolate candy bars that are usually available here are a little too sweet for my likes. So sweet that I can just eat one. And the only decent bar of dark chocolate around is not creamy. Though that doesn't stop me from eating my weekly quota. 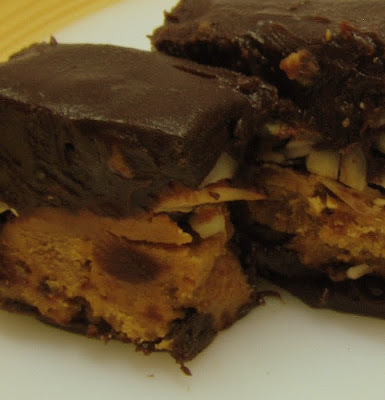 And so I started thinking of all the components that would make the perfect Chocolate bar - which is not too sweet but yet creamy and goey and maybe a crunch in between as well :). And hence was born this perfectly amazing treat. 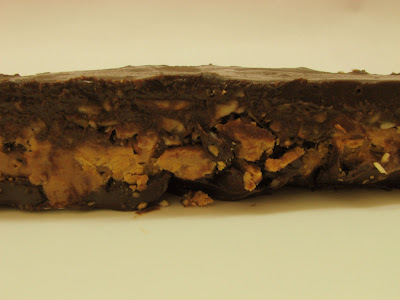 I made one big chocolate bar in a circular cake tin of 8 inches diameter and then cut it into bite-sized squares. This turned out to be a little difficult and gooey as a some of the chocolate oozes out while cutting. For a neater look, I would prefer using small moulds next time. 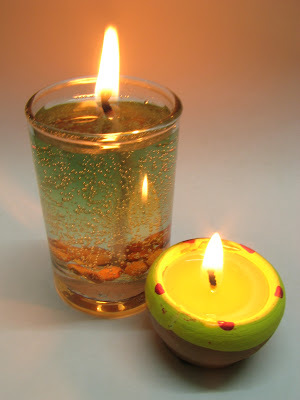 The last couple of days, the entire city of Bangalore has been in a festive mood with brightly lit-up clay lamps (diyas) adorning the threshold of houses, happy children bursting fire-crackers, people sharing their Diwali sweets with friends and so on. The evenings saw the city skyline brightened with fire-works from almost every neighbourhood. Though I don't celebrate Diwali, the festive spirit rubbed off on me pretty soon and I was on the hunt for recipes of Indian sweets. For some reason, I've never attempted to make Indian sweets till now (may be because there are so many sweet shops nearby). It's cake-time again :). I just love making cakes. And do you know what is the best part about making cakes? After setting the cake to bake (Disclaimer: The next part of the sentence is not for the faint-hearted), licking the mixing bowls for any and every trace of the cake batter. Sounds gross? My family thinks so too. So I have the mixing bowls all to myself and I purposely leave behind generous amounts of cake batter in the bowl :). 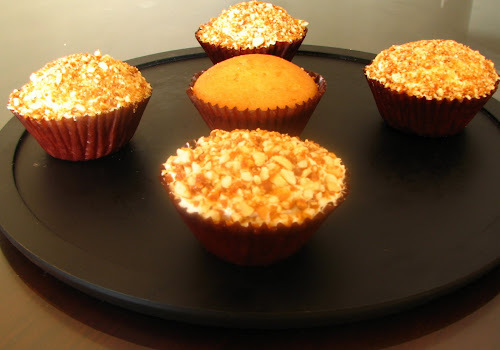 This time, I again baked cupcakes simply because it takes lesser baking time. And also, I wanted to experiment on different topping options. So I decided on a plain vanilla cupcake. And for the frosting, after much searching for recipes and ingredients, I finally settled for the frosting recipe suggested by my brother. It is posted at the Tasty Kitchen here. I reduced the amount of sugar though. I dipped a couple of the frosted cupcakes in chocolate shavings. Actually, I found it very difficult to scrape out the chocolate shavings from a bar of cooking chocolate. Even after 15 min of hard work, I could just get enough for 2 cupcakes! So I didn't bother wasting anymore of my precious time scraping a chocolate bar. Next I got some peanut candy and crushed it coarsely with my trusty pestle and dipped some of the cupcakes in crushed peanut candy. I also left a couple of cupcakes plain as there are a few plain cake lovers in my house. The two cupcakes with chocolate shavings sprinkled got over before I could look for my camera so I don't have pictures them. All in all, the cupcakes were wonderfully soft and moist. The frosting was indeed brilliant. And the chocolate shavings and crushed peanut candy added an interesting bite to it. August was such a busy month with so many things happening and loads of work, it was impossible to even think about blogging. I’m back and I am so happy to bring you my favourite sweet of all times. 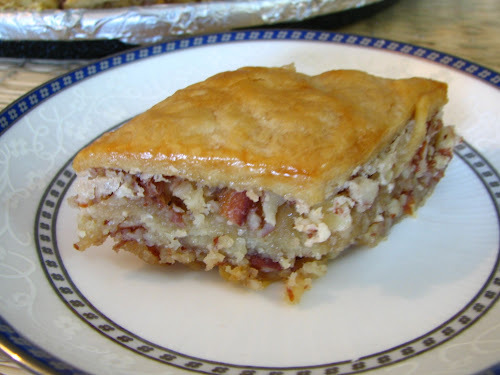 According to me, it should be declared “the king of sweets” – it is the Baklava. Growing up in the Middle-east, I was always fascinated with Middle-eastern foods - especially their grilled meat, fresh salads, hummous, shawarma, baklava, etc. Baklava used to be a regular at our house during parties and get-togethers. No celebration was complete without it. After coming back to India, I have missed the baklava and the shawarma the most. We do find a poor replica of the shawarma in Bangalore and Kerala. It is not even close to the actual Arabic Shawarma but at least there is something. The baklava, however, was impossible to find. Whenever family or friends from the Middle-east visited us and if ever anyone dared to ask me if I wanted anything from there, the baklava and the shawarma would top my list (and chocolates, of course!). And those kind people brought those delicacies for poor (baklava-and-shawarma-starved) me all the way from the middle-east. Ever since my parents gifted me an oven (they know I love to bake), I’ve been trying to find recipes to make baklava at home. All the baklava recipes that I looked at, needed store-bought phyllo dough. And I couldn’t find phyllo dough anywhere here in the stores of Bangalore (What a tragedy for a baklava-addict!). I started to feel envious of all the people who had easy access to phyllo dough. I recently heard a little boy in a pizza parlour sighing "I wish pizza was healthy". The boy loved eating pizza but I guess he was not allowed to have it on a regular basis because it wasn't considered healthy. I have often heard myself thinking on the same lines. It feels like a cruel joke sometimes. A food is so delicious that you can go on eating it for the rest of your life. But the catch is that, if you do so, you might not be left with much of a life! Though I am not a health-freak or anything, I sometimes try to find middle-ground in the battle between taste and health. One such experiment is my recipe for this post. 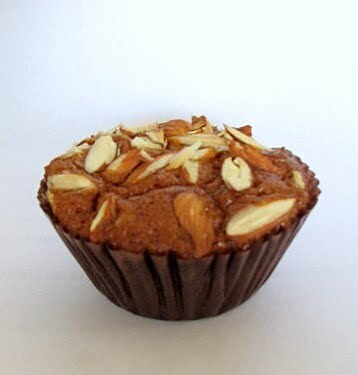 I've been trying to make a cupcake that tastes wonderful and is also healthy. Carrots have been added to this cake for fibre and for the vitamins, minerals, other good-for-health stuff that are present in it. Thus making the cake healthier than their no-carrot-added counter-parts. I know, I know, you must be thinking that there are already a 100 plus carrot cake recipes on the net. But this recipe is the result of my cooking experiments. And I can guarantee you that the end-result will be delightfully yummy. One of my favourite party foods is Pizza. And what kind of pizza is the best? Home-made, of course and its so easy to make. In fact its one of the easiest party foods to prepare. 2) Make the pizza sauce. This can be made a couple of days in advance and frozen. 3) Get your favourite toppings cooked/chopped/sliced and the cheese grated. 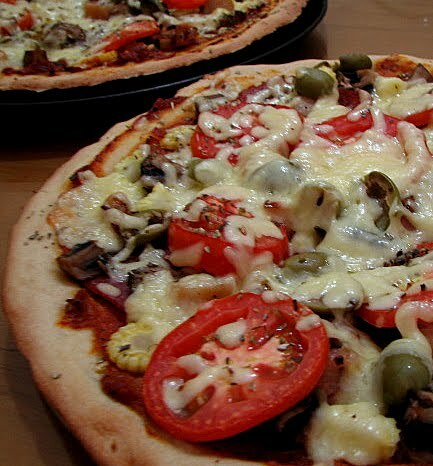 In fact, if its a party of close friends/family, you can ask each one to bring their favourite topping. 4) If making thick pan pizzas, then you will have to blind bake the pizza bases before-hand. Assembling and baking the pizza hardly takes 20-25 minutes or so. And can be done even after the guests have arrived so that the pizza can be served piping hot. Maybe even tweaked to individual preferences. Or even individually assembled, if your guests are keen and few in number. White bread has earned a bad reputation in recent days for not being nutritious, lacking fibre and using chemicals to bleach the flour used to make it. Brown is the way to go, experts say. Then again does having nutritious, fibre-packed accompaniments to white bread reduce at least a couple of its negative effects? As for me, whether white or brown, my love-affair with bread continues. Even though I’m from a place where rice is the staple food, if given a choice, I would gladly choose bread over rice. Maybe it’s because I have a lot of favourite childhood memories about fresh bread. Back in those days brown bread was unheard of where I lived. I vividly remember the man from Casino hotel, who used to come to my Grandmother’s house to sell bread. He used to come riding his cycle with a big wooden insulated box behind him which was safely secured to the cycle. The moment he opened his box, the most wonderful smell of fresh baked bread would fill the house. One whiff and all of us kids would come running and peer into the box. My mother used to buy half a dozen loaves and a few packets of buns. Most of the purchase would be gone in seconds. She would have to hide a couple of loaves if she wanted to serve it for dinner/breakfast. The bread from Casino hotel is the best bread that I’ve ever tasted. It was so soft and light that the entire loaf could be rolled up into a ball that could fit in the palm of our hand. Another recollection is of the friendly person who used to work in the nearby supermarket. Everyday, he used to save 3 packets of fresh buns for us and hide them in the lowest rack of the bread shelf in the store so that no one else would notice it. And my dad would pick it up in the evening from the shop just to be hungrily devoured by 3 bread-crazy kids in the next few seconds. 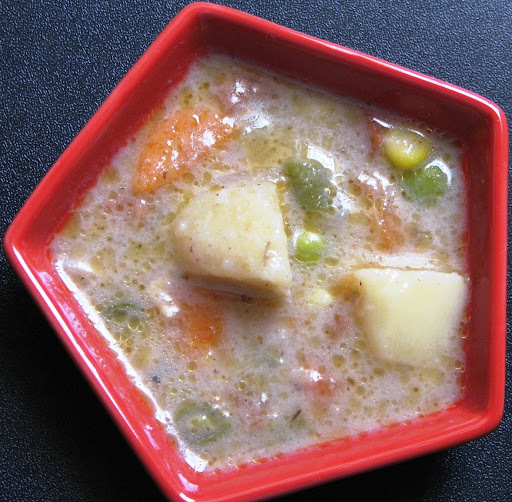 Since we enjoy eating bread so much, I often make a stew that goes very well with it. This recipe was handed down to me by mummy dearest. This stew goes well with appam too. 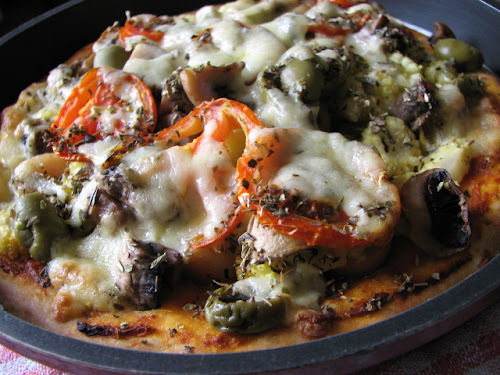 It can be made with any number of vegetables or meat or a mixture of both. I'm just taking my first few faltering steps into the blog world. Deciding on the blog title itself took me more than 6 months. Somehow I just wasn't satisfied with whatever I came up with and would change the title every other week. Writing and cooking have been my favourite pass-times ever since I was 10 years old. But then, recently I haven't been able to do much of both though I very much wanted to. Life and it's responsibilities had eaten up the time that I had for my hobbies. And soon enough, the days seemed relentless. I realised a few months back that I really needed to spend some time on things that I enjoyed doing. It helps in keeping me sane.